How healthcare can be delivered differently and how hospital buildings can play a crucial role in this has been subject of two earlier blog posts discussing aspects of flexible working in a hospital setting and the patient – caregiver interface. In this final and third post (for the time being at least…) covering Orbis Medical Centre in Sittard / Netherlands, I would like to focus on the layout and configuration of the in-patient wards. Coming from Germany and being used to hospitals with closed bedrooms in wards, either as single accommodation or as shared rooms with 2-4 beds each, I have to say I was quite shocked when I first visited an NHS hospital in the UK, where open-plan wards are the norm. In my case I visited a brand new hospital – UCLH in Central London on Euston Road. Wards contained 24 beds, grouped in six bays of four beds, each bed separated from the others by a curtain only. Bays were centred around a nurses station. Clearly, nurses could do their job of monitoring patients and delivering care most efficiently in this setting. However, from a privacy point of view, I found this quite uncomforting – even though patients can shield themselves from unwanted views, sound cannot be blocked. You would hear each moan, cough or cry from a patient near you, as well as conversations of private or medical nature. I only understood what this configuration really means much later, when my sister-in-law gave birth to her daughter in UCLH and had to stay with her newborn baby for five nights, surrounded by other sleep deprived mums with crying babies. It seemed at least one baby was crying constantly and I can’t imagine how any of the new mums in there would have got any sleep at night or rest during the day. This highlights one of the main problems of wards – on the one hand you want to give patients privacy and much needed rest to heal, one the other hand easy access to patients and visibility is important for at least two reasons: to ease the job of nurses, and to provide patients with a sense of community, especially those who are staying for longer and could feel quite lonely soon. So how would you solve this dilemma, for neither the UK solution of open-plan wards nor the German solution of closed bedrooms seems to cater for both needs, the desire for privacy as well as community? Again, Orbis has found a flexible design centred on patient’s choices and needs that feels exemplary to me. Wards are arranged on long corridors with a nurses station in the centre. To both sides of the nurses station, single bedrooms are lined up, one next to the other, each enjoying external views. The corridor in the centre is very wide and accommodates communal spaces, like small communal dining tables, soft seating areas for patients, workstations for nurses and a small kitchen for nurses to prepare fresh sandwiches and snacks. It has full sized windows at the end with a view to the outside, so that the communal areas are naturally lit and feel inviting. While the communal areas in the centre of each ward provide opportunities to meet other patients, spend time with family and friends and enjoy a sense of community – with nurses as well as with other patients and visitors, this would only work for those being able to get up from their beds and walk. So what about those patients bed-ridden? As shown in the image below, a simple design solution solves this: the walls between single bedrooms and the communal areas in the centre are flexible. They are made of glass and patients have an electronic control reachable from their beds to change the shutter settings – from completely open to completely shut or anything in between. The same goes for the doors obviously – they can either be open or closed by the patients. Therefore patients have a maximum of choice of how much privacy and how much community they need at any one point in time and can conveniently switch between different settings. 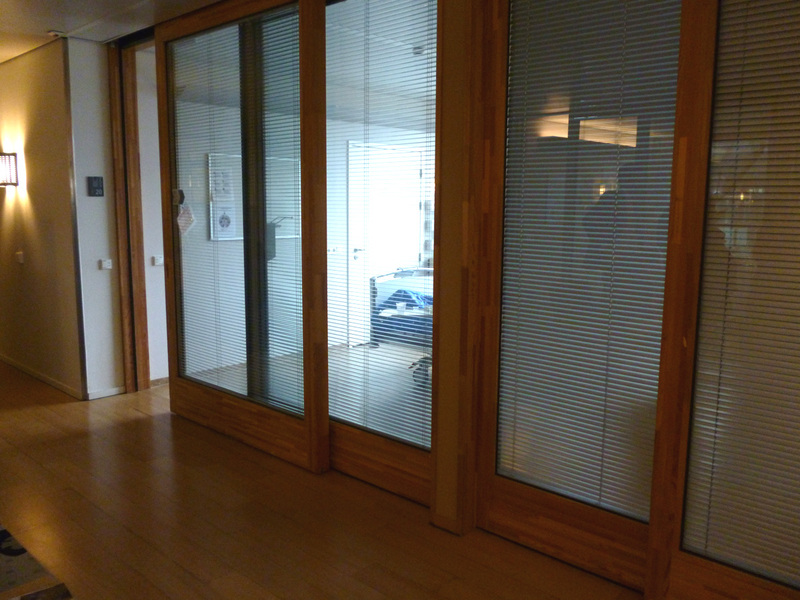 Two adjacent bedrooms for in-patients in an Orbis ward: one patient choosing community with shutters and door open, the other one opting for privacy with shutters and door closed. This feels so logical and easy that I can’t help but wonder why other hospitals have not taken up this idea and copied it into their designs. Is it because of the technical nature of the solution involving electronic controls? That can’t be the case, since hospitals have controls for emergency buttons anyway, and are generally relatively highly technical buildings. Or is it because hospital designers and healthcare facilities managers have not heard of or thought of it before? Well, let’s spread the word then. Figures, doors and passages – revisited. Or: Does your office allow for sociality?